Los Angeles officials are going forward with a $40,000-a-mile program to coat public streets to fight climate change, despite the city’s many financial challenges — including a $73 million budget shortfall for dealing with the ever-expanding homeless population. The program uses a light-colored sealant to cover the streets, which decreases the pavement temperature of so-called “heat-islands,” according to media reports. The LA Street Services began rolling out the project last May, which preliminary testing shows has reduced the temperature of roadways by up to 10 degrees. The project involves applying a light gray coating of the product CoolSeal, made by the company GuardTop. $40,000/mile to paint roads white. Last year, the L.A. Daily News reported on the high cost of the project — and that local officials approved it nonetheless. The morning temperature of the black asphalt in the middle of a nearby intersection read 93 degrees. The new light gray surface on Jordan Avenue read a cool 70 — on what would turn out to be the first heat wave of the year. “It’s awesome. It’s very cool — both literally and figuratively,” exclaimed Councilman Bob Blumenfield, whose Los Angeles district includes Canoga Park, squinting into the laser handheld thermometer. “We are trying to control ‘the heat island effect’ ” — or hotter temperatures caused by urban sprawl. “The downside: we won’t be able to fry eggs on the streets,” Blumenfield said. 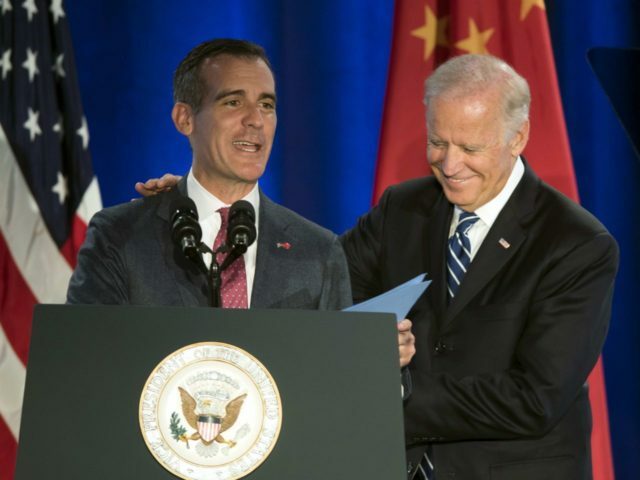 Los Angeles Mayor Eric Garcetti, who is eyeing a run for the White House in 2020, has embraced the program “as part of an overall plan to reduce greenhouse gas emissions in the city by 45 percent below 1990 levels by 2025,” according to Fox News. And environmental activists are praising L.A.’s street-sealing project. “Advocates are confident that advances in asphalt technology will drive down the cost,” Mother Nature Network reported on Sunday. “There’s also the related economic benefits to consider: in once-sweltering neighborhoods where streets are now painted white, residents will be less likely to crank the air conditioning on full blast, leading to significant savings on energy bills and decreased emissions,” the website reported.